'Paolita' invites you to an exclusive swimwear event! As Summer approaches, swimwear heads to the top of our 'must-have' list and when you're on the beach, it's important to look and feel your best. If you're in search of that extra bit of luxury for that Summer get-away, then 'Paolita' may just be the brand for you! Anna Paola is the figure behind the brand and has worked with high-profile designers, such as Hussein Chalayan and the iconic Alexander McQueen! 'Paolita' is a great up-and-coming swimwear brand that exudes individuality, with its exotic prints and high-fashion edge. 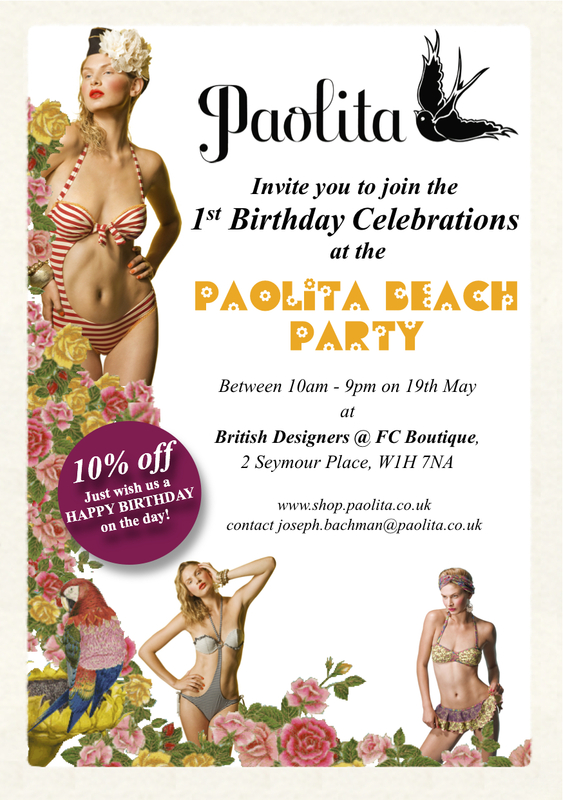 In honour of Paolita's 1st birthday, the brand is throwing a fabulous beach party with a pop-up shop. The event takes place on Thursday 19th May between 10am and 9pm at British Designers @ FC Boutique in central London. The best thing, is that you are all invited! You will be able to experience first hand the current Spring/Summer collection for 2011 and guests will receive 10% off their purchases with an invite.. so just print off the invitation below to claim your discount! It's time to make a splash! Leia Lingerie and the Freya "Pier" bikini..
With the weather hotting up and the flip-flops coming out more regularly, it's hard not to think about planning a relaxing summer holiday in the sun. On a recent shopping expedition, I couldn't help but admire the colourful swimwear collections on the highstreet, but as a 28FF, I sadly resigned myself to the fact that finding the perfect fitting swimwear was going to be a challenge. For years, I've had problems finding swimwear in my size - buying bikini separates in a size 14 for my top half and size 10 for my bottom half just doesn't cut it and gives little support. I decided that the only option was to buy swimwear that fits like underwear and comes in cup sizes. The only problem with this, is that most highstreet brands start at a 32 back, so I still couldn't find the perfect bikini..that was until I discovered the gorgeous Freya swimwear stocked at Leia Lingerie. As a loyal customer to Leia Lingerie, they kindly offered me the opportunity to wear-test the Freya "Pier" halterneck bikini and ruffle bikini briefs in red - a set that I have been lusting after for some time! As you can see from the picture, the "Pier" bikini is a striking bright red with little white polka dots - a colour and design guaranteed to turn heads on the beach. The style of the bikini top is extremely flattering for bigger busts, showing off your cleavage without revealing too much flesh. 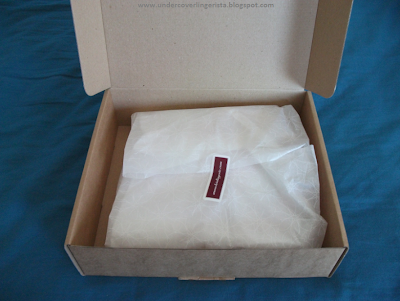 I chose the ruffle briefs, as a higher cut at the sides gives the impression of lengthened legs. The ruffle detailing and polka dots on this bikini give a real pin-up/ retro feel, making it a classic style that will suit every curvy girl, regardless of shape or size. In terms of support, I have never tried a bikini that I have felt comfortable running around the beach in, until the "Pier" came along! After giving it an extensive "jump test", I can confirm that the back remains firm and supportive and there is no worry at all about slippage or falling out! This has always been a worry for me, but in this bikini, I'd feel totally happy going on the most exhilirating of water rides, playing games on the beach and swimming in the sea! The bikini is also made from 'XtraLife' lycra, so you can rely on this bikini to deliver in both quality and comfort, whilst getting the support you'd otherwise only find in a bra. All in all, I am very impressed with this bikini from Freya. It is stocked in a wide range of sizes (briefs from XS-XL) in cup sizes C-GG and back sizes 28-40. I would definitely recommend it to any curvy girl looking for great support on the beach! The "Pier" bikini is currently available in red and green on leialingerie.com, but don't fret if you can't find your size, because Leia are launching a variety of "Pier" styles in pink and classic black in June and July of this year respectively! Let the 2011 summer holiday count-down begin!